Front Seat, Back Seat, Buckle Up! We have much to thank the late Nils Bohlin, whose birthday is coming soon on 17 July 1920. 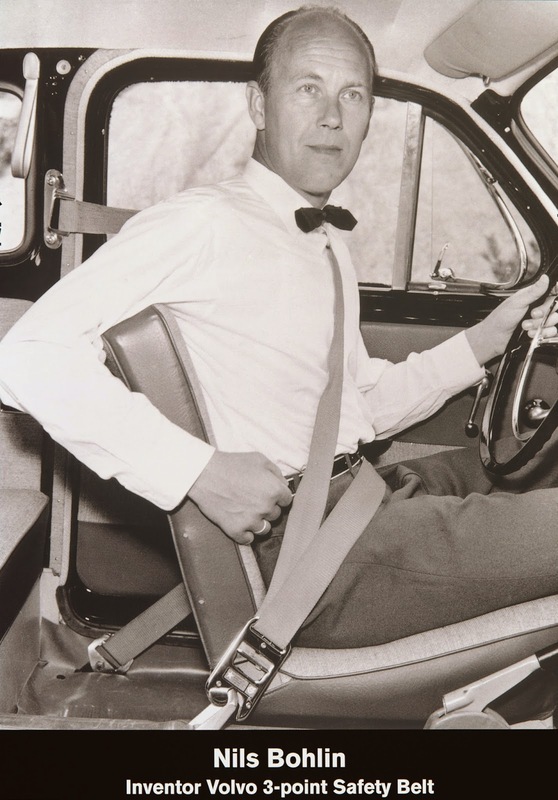 He was hired by Volvo as an engineer and invented the three-point seat belt some 55 years ago while working with the Swedish automaker most renowned for safety. Up until then, seat belts had only two-points – like the ones on airplanes – and did not provide a restrain across the chest (imagine doubling over while going at 100kph). Volvo was granted a patent for Bohlin’s invention in 1962, but a few years later, they released it for free to other carmakers. The invention has since saved millions of lives. So, Mr Bohlin, wherever you are now, thank you. We imagine you as a guardian angel looking out for passengers in the more than one billion vehicles on the road today. Unfortunately, though, this brilliant invention is one that is not fully utilised, especially by backseat passengers. A 2007 study by the Malaysian Institute of Road Safety Research (MIROS) discovered that 350 deaths, 700 serious injuries and 2,100 minor injuries on the country’s road happened to passengers riding in the backseat (for private vehicles), which could have been reduced by 40% to 50% if only they had buckled up. Statistics published by FIA Foundation show that 81% of drivers and passengers surveyed considered it ‘extremely unacceptable’ to not put on the seat belt when seated in front, but the disapproval drops to 64% when considering seat belt usage for rear passengers. One of the justifications for the unimportance of rear seat seat belts is that accidents are unlikely to occur during short drives. According to the California Department of Motor Vehicles, however, more than half of all traffic fatalities occur within a 40-kilometre radius from home. Drivers are more confident on routes often travelled and familiar, and thus concentration tend to lapse as they approach home. At the speed of 50kph, a 60kg rear passenger spurred by momentum can fly into the front seat with an impact of up to 2.4 tonnes, severely injuring or even killing the front passenger (who had probably wore his seat belt); at the risk of sounding like a nag, even if you do not value your own life, we’re sure you do not want to inadvertently kill someone else with your action or rather, lack of. By the way, Princess Diana could very likely still be with us today if she had remembered to wear her seat belt during her getaway attempt from the paparazzi. In Malaysia, the law requiring rear passengers to wear their seat belts was only introduced in 2009. Old vehicles (registered before 1 January 1995) that were not already equipped with rear seat belts are exempted; what’s more surprising, though, and not in a good way, are that rear passengers aged 17 and below will not be issued a fine if caught without the seat belt on and also exempted are toddlers seated on an adult’s lap. Does this not go against our general inclination to value the life of youth and children more?